During chilly fall and freezing winter, our skin needs extra care because it is more sensitive to cold than warm weather. Temperature fluctuations, air humidity, wind, air heaters (as we spend most of the fall/winter period indoors), poor functioning of sebaceous glands (freezing weather impedes oil glands functions) all contribute to skin problems. As a result, our skin becomes week, dry, pale and, eventually, old-looking. These skin care tips will help you avoid these problems. The major metamorphosis is that changes in weather trigger the change in a skin type. Normal skin assumes some traits of a dry type while dry skin becomes prone to irritation. Oily skin either remains unchanged or turns into normal type. It all calls for some corrections of our routine skin care practices. Whatever the type you have, make sure you follow hard and fast rule about fall/winter skin care – wash your face with hot water no more than twice a week. Hot water enlarges pores, which may hurt you skin. What’s more, hot water dries the skin out, washing away oil that works as a natural moisturizer. Try to wash your face with cool or room temperature water (you can also add some lemon juice to water). If after staying for a long time outdoors your skin shrinks and starts peeling off, apply a damp compress or a hot pack as you get home. For compress, dip a towel into hot water or warm chamomile mint tea and apply it to your face for 2-3 minutes. Remove the towel, wipe your face with sour cream or sour milk and wash everything away. For facial masks, it is also good idea to use various oils – olive, corn, almond, and unrefined sunflower oil. It would also be good for your skin if you stayed away from scrubs and peelings in winter. If you have a dry skin type, do not use scrubs more than two times a month! How to Reduce Skin Irritation in Winter? To boost skin’s protective functions, wash your face with calendula flower tea. Calendula would help to settle down irritation and redness. The herb would also protect the skin from environmental influences, such as wind, temperature fluctuations and freezing air. 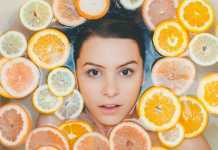 Where to Get Vitamins for Your Face Skin? Almond oil has the same soothing, nourishing and vitaminizing effects. It’s a rich source of proteins, vitamin E, magnesium and phosphorus. In addition, almond is rich in zinc, cuprum, manganese and the B vitamins essential for healthy and beautiful skin. Don’t forget about skin protection creams. “Winter” thick creams are usually enriched with vitamins and useful substances. Apply “winter” creams at least half an hour before you go out. If you have oily skin and enlarged pores, dampen your face with cotton tampon soaked in tea or lotion after applying the cream. Squeeze a cotton tampon and slightly wipe your face with it. Wait 1-2 minutes after you feel a light shrinking sensation and then apply a powder. By the way, it is better to wash your face not later than an hour before you go out. And, of course, your lips need care! In cold season, it is smart to remove lipstick with a cotton wad. You can also make special “lip masks” before bed. Apply a thick layer of honey or wipe them with carrot juice. Following these tips will keep cracked lips and cold sores off. Source of the image: parade.com. Another great tip is to stay at home. I hate cold windy weather (my skin does as well)! When it’s so sold and snowy outside I wish I lived in Brazil or Tunisia! This would be great! It only has the opposite effect on my skin – it gets only worse. And even autogenic training wouldn’t help here, I think. Great tips for beating dry winter skin. It works great to gently hydrate my skin leaving it soft and glowing. I love this post, since I am really having dry skin during the cold weather. We should take good care of our skin whatever season there is. I just focus on normal things in winter to keep my skin healthy like eating proper food , vitamins and nutrients .Maintaining a balanced diet is very important.one should eat green leafy vegetables , fruits and lots of water to keep track on things. For winter , i use mixing equal parts of olive, mustard oil and sesame oil and then massage it all over the body. This oil is very good for the skin and leaves it smooth and free from blemishes. How To Make A Guy Stop Flirting With You? Why Do Nails Become Yellow?